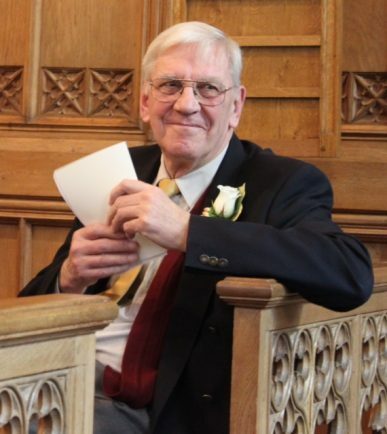 A WELL-KNOWN Bromsgrove pastor has died at the age of 85. Cyril Paul Lewis was born on Christmas Eve 1933 in Stroud, Gloucestershire and came to Catshill at the age of four when his father Joseph began evangelistic work in the village in 1938. Joseph’s work led to the The Mission on Woodrow Lane, now known as Welcome Hall Evangelical Church, becoming established in the community. Paul grew up in Catshill, attending the local Primary School and Bromsgrove County High, where he was head boy. He loved sport, captaining both the football and cricket teams. He was selected for the England Schools cricket team where he got the chance to play at Lord’s. Paul went on to study Classics at Birmingham University, and spent 15 happy years teaching at King’s Norton Grammar School. In 1973 he accepted the invitation of the Welcome Hall Church to be its pastor, following in his late father’s footsteps and served full-time for 37 years until his retirement in 2010. Paul had a busy life, preaching several times-a-week, pastoring a growing congregation of all ages and backgrounds, and leading a large community-based children’s and youth work – both through an afternoon Sunday School and associated weeknight activities. Jeremy Brooks, Welcome Hall pastor since 2012, paid tribute to Paul and his hard work. “The Welcome Hall story is a remarkable one by any measure, and Paul Lewis has been a huge part of that. “He loved his Saviour, the church and the local community, and gave his life to the Christian ministry. Paul died in the Queen Elizabeth Hospital, Birmingham, in the early hours of last Friday. He leaves his widow Mavis, four children, ten grandchildren and seven great-grandchildren. His funeral is at 11am at the Welcome Hall, Catshill, next Friday, February 15, followed by a burial at North Bromsgrove Cemetery.